No matter the level of study or development you are, I hope you have a teacher you check in with regularly that has a strong understanding in the physical instrument. What we all need to do, on a regular basis, is check in on that physical function of our fully body instrument. In other words, the ABCs. We can do some of it ourselves, as we become more aware of what to watch for and observe, and then having a teacher who can diagnose or re-adjust what you cannot see or sense is crucial for keeping the physicality aware and awake for your voice to find an authentic place to reside! Observing these tangible elements is really an ongoing and daily practice for those who are pursuing craft effectively! How are you moving? How are you standing or sitting while you speak? Where is there hyper-extension? Is there slumping or compression? Any locked spots? Any pressure spots? What position of energy do you "lead" from? High in the chest wall? Collapsed through the solar plexus? Compressed or pressed through the pelvis? We deal with what has been referred to “text neck” as a general issue in our current smart phone society. Is the head balanced on a long neck or does it push forward? Is there chin tucking or jutting forward? Is the jaw tight? Is the speaking voice in fry or is in buoyant? 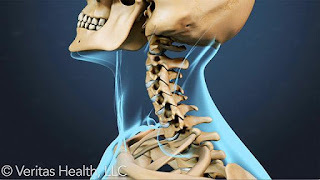 Is there range of motion in the complexity of the neck muscles or is there compression? As you begin to vocalize, how is your posture affected? How is the breath engaged? Is there ease or are you struggling? How are you accessing the breath? Can you find ways of engaging more elasticity in the body in order for the breath to have more buoyancy and release without adding voice or vibration to it yet? As you engage breath movement with the voice, how is your body responding to the athleticism of those intangibles? Is there fatigue? compression? tightness? collapse? grip? What happens on the onset of the voice? Are you paying attention to that initial and crucial onset for balance? As a teacher, I am paying attention to ALL of this with every singer when they walk in. As a singer, I am paying attention to all of this when I begin to stretch and workout my body, breath, and voice during a practice session. In the study of voice, one size does NOT fit all. We have to learn to recognize where we are and begin there. Learning to observe without criticism (!!) gives us permission to not judge and simply recognize the habits and behaviors that are not always conscious. This can then lead to more conscious CHOICE of changing habits and behaviors to better serve us. Consciousness. Awareness. Willingness. Clarity. Focus. Pliability. All of these are crucial to the singer, as well as the teacher, in order to discover what you need on any given day.